Stony corals are an ancient group, with a fossil record that stretches back hundreds of millions of years. Following the cataclysmic upheaval of the Permian Mass Extinction, which wiped out roughly 95% of marine life, the distinctive Tabulate and Rugose corals of the Palaeozoic found themselves fully replaced by ancestors of our modern fauna. This period was filled with great morphological novelty, as the newly emergent lineage of scleractinian corals quickly evolved into a variety of different forms to fill the many open niches left vacant by extinction. Over time, most of these early experiments in coral life would die out, but a few have managed to tenaciously hang on into the present day. 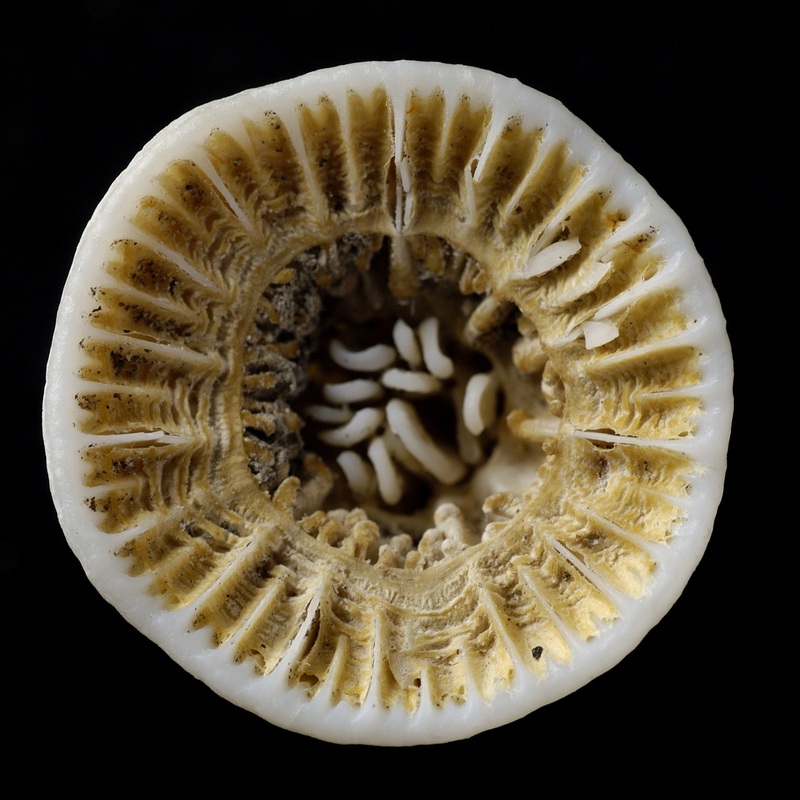 But how do we recognize these living fossils from the many corals that evolved later on? 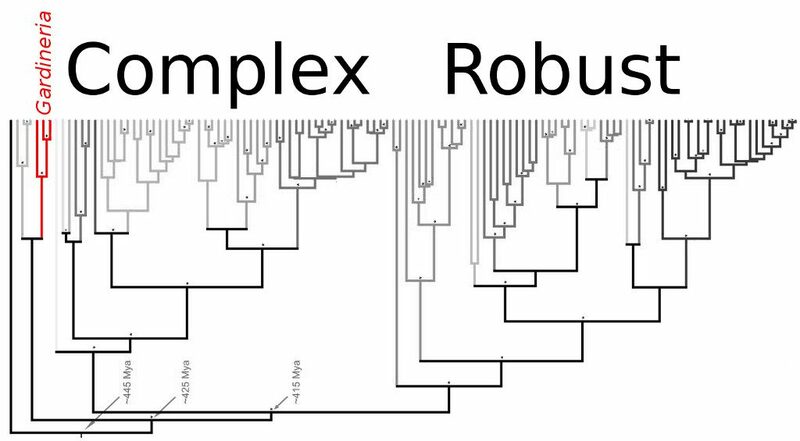 The different ways in which an aquarist might classify a coral—LPS vs SPS, Solitary vs Colonial, Branching vs Encrusting—are quite irrelevant here, so to fully understand what makes a species “primitive” we need to look at a finer morphological scale. 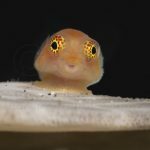 Genetic study has in recent years upended our understanding for how the scleractinians diversified, and the group is now known to be divided into two major lineages: the “robust” and “complex” corals. But, before either of these groups appeared on the scene, the reefs of the Triassic were home to a diverse lot known informally as the epithecate corals. 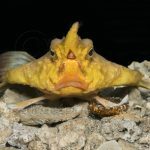 Today, just a handful of species in the Family Gardineriidae survive, but, despite their important position in the evolutionary history of stony corals, only a small number of researchers are likely to have any familiarity with them. 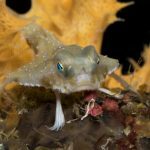 These are wee little creature that live solitary lives in the inky blackness of the ocean deep, typically in excess of 100 meters. In outward appearance, a gardineriid doesn’t look all that special and would strongly resemble some of the other deepwater, azooxanthellate corals that live alongside it, such as flabellids (e.g. Rhizotrochus) or dendrophylliids (e.g. Balanophyllia). But these superficial similarities belie a deeper distinction. To understand why Gardineria is such a special snowflake, we have to look at how it constructs itself, and, in particular, how it constructs the outer wall of its skeleton, the theca. 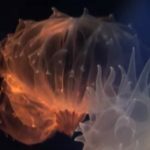 I will try not to barrage you, dear reader, with too many unfamiliar terms here, but appreciate that there are many different ways in which a coral can go about surrounding its naked polyp with calcium carbonate. In some, this outer wall is a distinct structure (i.e. “marginothecal”), which implies that internally it has a central region from which the aragonitic crystals of the skeleton develop. In other types of coral, the outer wall can lack this arrangement, instead being formed by a thickening of the septa (i.e. “septathecal”) that radiate towards the center of the polyp. These different wall structures can really only be appreciated by cutting through a skeleton to expose the underlying crystalline formation and then examining it with various types of microscopy. It is, most assuredly, an arcane branch of zoology that few are experienced in. 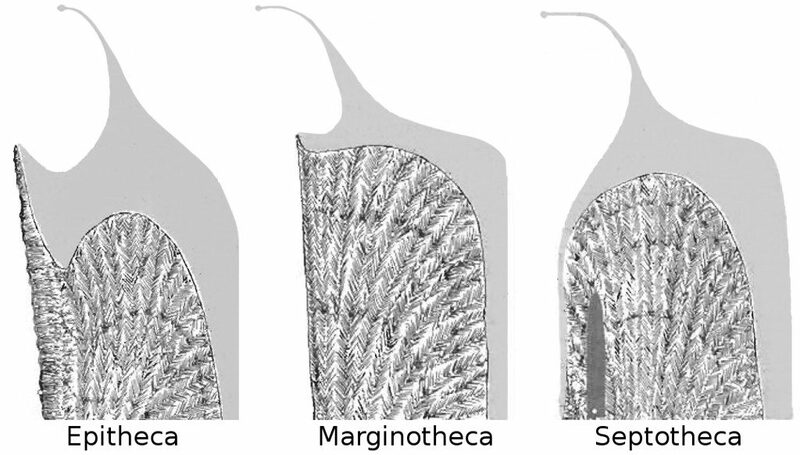 Diagram of various thecal morphologies with septum. Tissue is indicated in grey. Gardineria (left), Flabellidae (middle), Caryophylliidae (right). Modified from Stolarski 1996. The outer wall of Gardineria is neither marginothecate nor septothecate (nor any of the other varieties that exist). Rather, it forms its theca from a thin cement of aragonite that lacks the sort of internal crystalline arrangement that we see in other corals. This same sort of material is often veneered onto the true outer wall in other groups to act as a defense against the many boring and grazing organisms that can damage a coral’s skeleton. 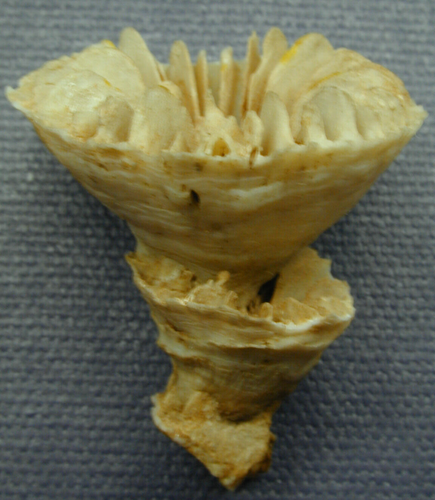 For this reason, it was given the name epitheca (from the Greek prefix for “upon, above”, since the epitheca normally sits atop the true theca in modern coral groups). Among aquarium corals, you can spot an epitheca in the smooth, annulated base of Trachyphyllia or the anthocauli formed by some asexually reproducing plate corals. The rarely seen azooxanthellate Culicia is another particularly good example. Today, only in the gardineriids do we find an outer wall formed entirely of epitheca, but, when we look back into the fossil record, many of the earliest scleractinians exclusively employed this method of skeletal construction. So, rather than being some minor detail, the epithecate wall of Gardineria appears to be a “primitive” feature that has been lost in every other surviving lineage of stony coral. So what brought about this paradigm shift in coral biomineralization? To understand this, we need to examine the ecology of a Mesozoic reef. Unlike today’s shallow seas, which are full of carbonate platforms on which coral larvae can easily settle and grow, the Triassic environment was dominated by soft sediments that inhibited the formation of large reefs. Instead, the stony corals of that era were primarily solitary forms that managed to stay atop the substrate. Branching (=phaceloid) colonies were also abundant, but these would have been buried in the sediment, with only the upper tips of the branches exposed. This mode of life was successful for many millions of years, but, near the end of the Jurassic, this dynamic shifted with the appearance of an increasing variety of bioerosive animals that could damage an exposed epithecal skeleton. On the other hand, many newly evolved groups began to appear which had lost their epithecal ways, preferring skeletal types that allowed them to expand tissue beyond the outer rim of their polyps. 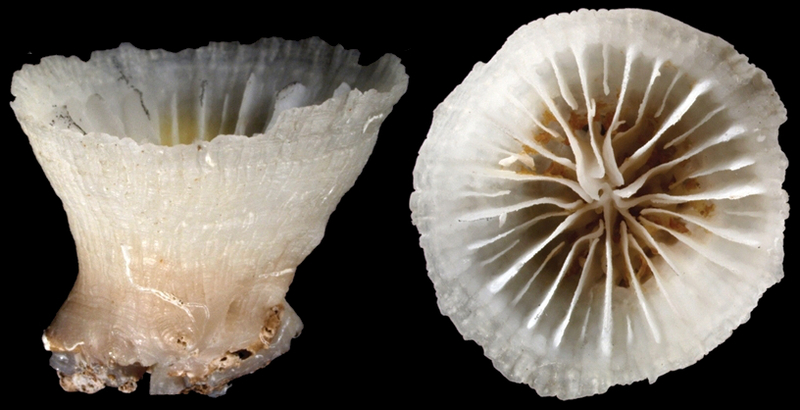 This proved to be a successful strategy, as it served to protect the skeleton from damage, and, when any damage did occur (say, form a parrotfish’s bite or the rasping of a snail), it could be quickly covered and repaired by nearby tissues—this is impossible for an eipthecate coral to do, since its tissue is confined within the polyp. By the time that the Cretaceous came around, the biodiversity of epithecate corals had plummeted. The dominant solitary and phaceloid forms of the earlier Mesozoic, which in their heyday included dozens of genera, gave way to just a handful of survivors. And so today, while there are still a few phaceloid corals like Euphyllia and Caulastrea around, these live directly attached to the reef and are without exception derived from more recently evolved, non-epithecate lineages. This is obvious when examining the tissue of these corals, since it extends to cover portions of the outer wall in a way that a true epithecate coral could never accomplish. 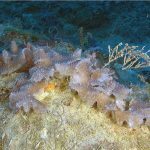 It is only in Gardineria that we find the ancestral condition, and, likely for this reason, this coral is now limited to the briny deep, where the delicate skeleton of this living fossil is relatively safe. Cairns, S., & Kitahara, M. (2012). An illustrated key to the genera and subgenera of the Recent azooxanthellate Scleractinia (Cnidaria, Anthozoa), with an attached glossary. ZooKeys, 227, 1. Roniewicz, E., & Stolarski, J. (1999). 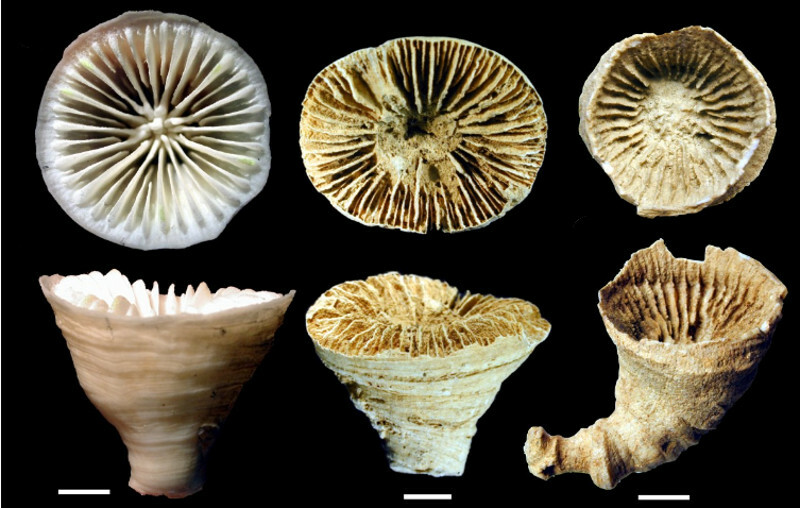 Evolutionary trends in the epithecate scleractinian corals. Acta Palaeontologica Polonica, 44(2), 131-166. Stolarski, J. (1996). Gardineria-a scleractinian living fossil. Acta Palaeontologica Polonica, 41(4), 339-367. Stolarski, J., Kitahara, M. V., Miller, D. J., Cairns, S. D., Mazur, M., & Meibom, A. (2011). The ancient evolutionary origins of Scleractinia revealed by azooxanthellate corals. BMC Evolutionary Biology, 11(1), 316.